The Board of Directors of the Vienna Institute for International Economic Studies (wiiw) has elected Hannes Swoboda as new President of the wiiw. From 1996 to 2014, Dr. Hannes Swoboda was Member of the European Parliament, for the last two years as President of the S&D Group. From 1988 to 1994 he was Municipal Councillor of the City of Vienna, responsible for urban development, urban planning and staff; transport; external relations. He is also President of the FH Campus Vienna and of the Architecture Centre Vienna. Hannes Swoboda replaces Dkfm. 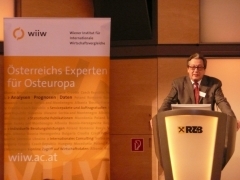 Ferdinand Lacina, former Austrian Minister of Finance and wiiw President since 1984. The staff and the management of wiiw are most grateful to their long-time President for his firm commitment and his strong substantive interest in the research of the Institute as well as for providing strategic impetus. During his presidency the Institute grew significantly and could expand its research: apart from the analysis of economic developments in Central and Eastern Europe, the wiiw now also investigates issues of European integration, the European Neighbourhood and global economic growth. Today, the wiiw enjoys high international reputation. Thus, for instance, the Institute ranked 12th in the 2014 Global Think Tank Ranking in the category ‘International Economic Policy Think Tanks’.